Book Condition: Solid copy with some shelf wear and/or markings scattered throughout. Prime benefits, including worldwide, shipping are available. Comment: Solid copy with some shelf wear and/or markings scattered throughout. Prime benefits, including worldwide, shipping are available. Sold by E Zbuy and Fulfilled by Amazon. Gift-wrap available. 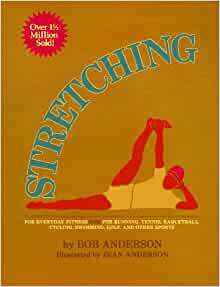 The book Stretching was first published in 1975 when fitness awareness was in its infancy. Stretching has since sold over two million copies in the USA and has been published in 24 foreign editions worldwide. 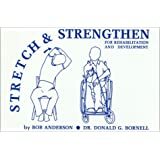 Now after twenty-one years and with many other books on the market, it has become the most widely-used and recommended book on stretching and its popularity continues to grow each year. The reasons for this may be the book's simple, user-friendly organization, the easy to follow individual stretches and principles, the ample line drawings by Jean Anderson, and the need for every body to stretch. Sold by E Zbuy and ships from Amazon Fulfillment. 5.0 out of 5 starsThe larger versions "Mini~Me"!==>Physical Therapist Approved! 1.Pocket Stretching Book is a perfect size for my gym bag. I put it in a zip lock bag to keep it nice. 2.My brother is a Chiropractor and he gave me the larger version over twenty years ago. 3.I used it so much, that years later I had to take it to an office supply store to have them hole punch and add a plastic binder down the spine of the book. I actually liked it better because it laid out flat. 4.My Physical Therapist was very impressed with this book and its size. 5.She was able to tag the stretches that were perfect for my situation/injury. 6.Thank you Bob Anderson for your simple to follow stretching books! 5.0 out of 5 starsFound it! I have had printed out copies of pages of this book several years ago but never had the book itself. I had stretches for biking and running, but not for the first leg of my triathlons, swimming. So without knowing the book name or the authors I found it on amazon - and got the 30th anniversary edition. Lots more in this edition, with exercises for desk sitters, manual workers, as well as athletes. Wonderful collection, very clear pictures showing exactly where the stretch should focus. 5.0 out of 5 starsMy brother is a Chiropractor and he gave me this stretching book over twenty years ago==>loving this 30th edition.Thank you! 1. My brother is a Chiropractor and he gave me this stretching book over twenty years ago. 2. I used it so much, that years later I had to take it to an office supply store to have them hole punch and add a plastic binder down the spine of the book. I actually liked it better because it laid out flat. 4.I also bought the Pocket Stretching Book. Its a perfect size for my gym bag. I put it in a zip lock bag to keep it nice. 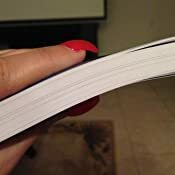 5.My Physical Therapist was very impressed with this book and its size. 6. She was able to tag the stretches that were perfect for my situation/injury. 7.Thank you Bob Anderson for your simple to follow stretching books! As many have written, a must have. I've had and used a copy of this book for over 15 years, and a friend saw it, mentioned that he wanted it. I bought a copy for his upcoming birthday, received the 30th Anniversary Edition, and, embarrassed to say, I'm keeping it for myself. This edition is a WONDERFUL upgrade, and even if you've had previous editions, the graphics and editing are well worth the money. There are stretches here for every level, and you can enjoy opening your body up a little at a time, or, if you are active, you can delight in new ways to prevent injury and enjoy this precious machine you're living in with flexibility and grace. This isn't one of those "I just got the product and it still has shrink wrap on it but I really, really love the cover so five stars" reviews. I've been using this book for over a month now. I have multiple books on fitness and stretching (including yoga and pilates), and I can say that this is a legit fitness book. Compared to my other stretching book (Stretching Anatomy), there is no comparison. While SA gives you lots of pictures and descriptions of the muscles you stretch, this book actually gives you series of stretching programs and teaches you how to enjoy them. SA's motto is "the more it hurts the better you're doing". This book's motto is "no pain no gain is a bunch of BS so don't hurt yourself and relax and enjoy the stretches". I love the stretching technique in the book. It helps you ease into a stretch and know when you're doing it right. After a month+ of use I can say that it works. I have used it after waking up, before going to bed, to warm up for pilates workouts in the morning, to warm up for running, cycling, weightlifting, and sports, to cool down from all of these, and to stretch out tight muscles in my back, legs and shoulders. The book is a wonderful resource and has helped supplement my other activities superbly. I recommend this book to everyone, athlete or non-athlete. You will benefit by learning how to stretch properly. I really enjoy this book. I have done some of the stretches. The illustration of each stretch is sometimes all that is necessary to perform the stretch although if you need more, there are directions for each stretch. In some cases, there is a stretch illustration that is marked with an X to indicate the incorrect way to perform the stretch and then the correct illustration is next to the incorrect one. 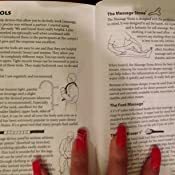 There is a chapter devoted to stretches for each major muscle that is used, such as the a chapter with stretches for the shoulders. At the end of each chapter, there is an illustrated summary of the stretches. 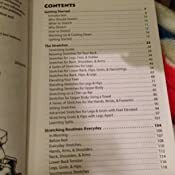 There is also a guide to stretches for many activities such as running, bowling, swimming, golf, and many others. I recommend this book to anyone looking for a comprehensive guide to stretching. 5.0 out of 5 starsI bought my first copy back when I was a competitive athlete in what seems like a former lifetime and before I became a health . I'm a physical therapy professional and I have utilized some of these stretches in the course of patient care from time to time. I bought my first copy back when I was a competitive athlete in what seems like a former lifetime and before I became a health care clinician. That copy is so old the center of the pages are yellowish brown and the outer edge of the pages were the same color brown as on the cover. I did notice some nice updates, What I particularly appreciate is the attention to explaining proper body mechanics to prevent substitution, that is something I'm VERY particular about and I couldn't find fault with any of the instructions given. I recommend this book to my patients I feel would benefit from it.